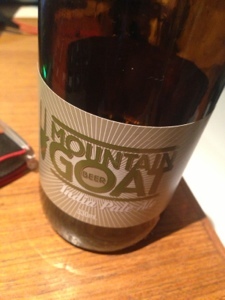 I’ve always liked the Mountain Goat beers. I fell in love with the Hightail many years ago, even though it had a habit of refermenting in the early early days. This is my first encounter with the IPA and won’t be my last. Big hoppy nose. Has a beautiful hop flower nose without the harshness. The palate too has a big hop (Citra and Galaxy) hit and a serious alcohol punch, yet the bitterness seems integrated and the palate is long. A big beer but an attractive one, the balance here is almost perfect. Great beer. This has just been added to the permanent range at Mountain Goat to go with the Hightail and steam ale, although it has appeared a couple of times in their 'Rare breed' range. I enjoyed a black IPA of theirs on christmas day as well.